Seven Iowa State University College of Engineering faculty have been selected for 2018 National Science Foundation’s Faculty Early Career Development Program (CAREER). 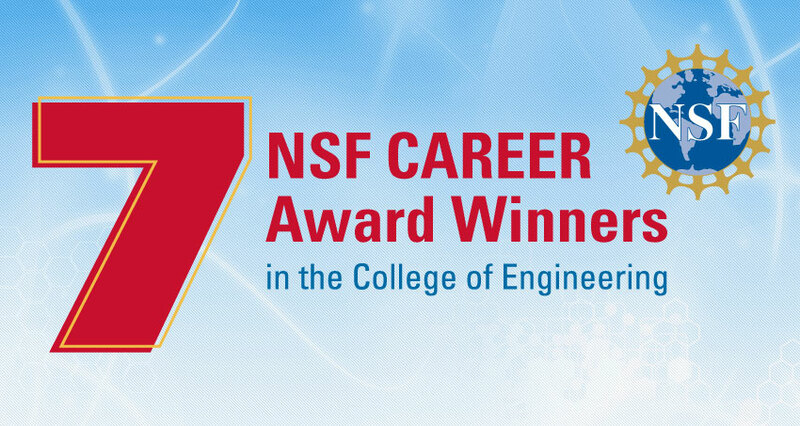 CAREER awards are the NSF’s most prestigious awards given to early-career faculty. The support aims to build a firm foundation for leadership in integrating research and education. The five-year awards total nearly $3.3 million and represent the first time that Iowa State’s College of Engineering has received seven CAREER awards in one year. Alipour will use a systems approach to create new design methodologies for electric power networks that will increase power grid resiliency in hurricanes, blizzards and other severe storms. She will also develop interactive educational opportunities for high school students, curricula focused on interdisciplinary research, industry partnerships, and a mentoring program to interest and educate the next generation of natural hazard engineers. Gong is developing graph-inference algorithms that quickly and reliably detect and combat cyberattacks. He will also integrate his findings into a graduate course on data-driven security and contribute to K-12 cybersecurity outreach and competitions. Hegde is developing faster and more accurate graph learning and inference algorithms that will improve decision making in transportation networks, social networks, and personalized learning systems. He will also create data science curricula and workforce development programs designed to increase the participation of women and underrepresented minorities in computational sciences. Hu will design techniques for self-assembly “nanomanufacturing” that will make the process more easily scalable, cheaper, and faster to create 3D nanostructures for next-generation clean energy technologies. She is also creating multidisciplinary research opportunities for undergraduate, graduate, and community college students from underrepresented minorities. Krishnamurthy will integrate patient data with cardiovascular modeling to create simulation, analysis and visualization tools that enable personalized treatment of heart diseases. He is also developing educational and virtual reality tools that illustrate heart health concepts to both K-12 students and adults. Ren is creating dynamics models and control algorithms for how cells change structure in response to external force, providing cell biologists with a new tool to control biochemical and mechanical cell changes. She will also develop a new undergraduate course in nanobiomechanics and an outreach program on using biomechnical methods in agriculture. Shao will study the influence of a subgroup of DNA that was thought to be of little use previously but recently discovered to be important to cell metabolism, opening a door to new biotechnology and improvements in human health. She is also developing unique undergraduate research programs, mentoring next-generation STEM teachers, and promoting the participation of underrepresented groups in STEM.